With so many new faces here, I thought I’d pop in and let you know what’s been happening in the studio. I also wanted to share with you a few of my favourite things! If you haven’t been here before, welcome!! It’s so lovely to have you here to share in the Molly and Mama journey. 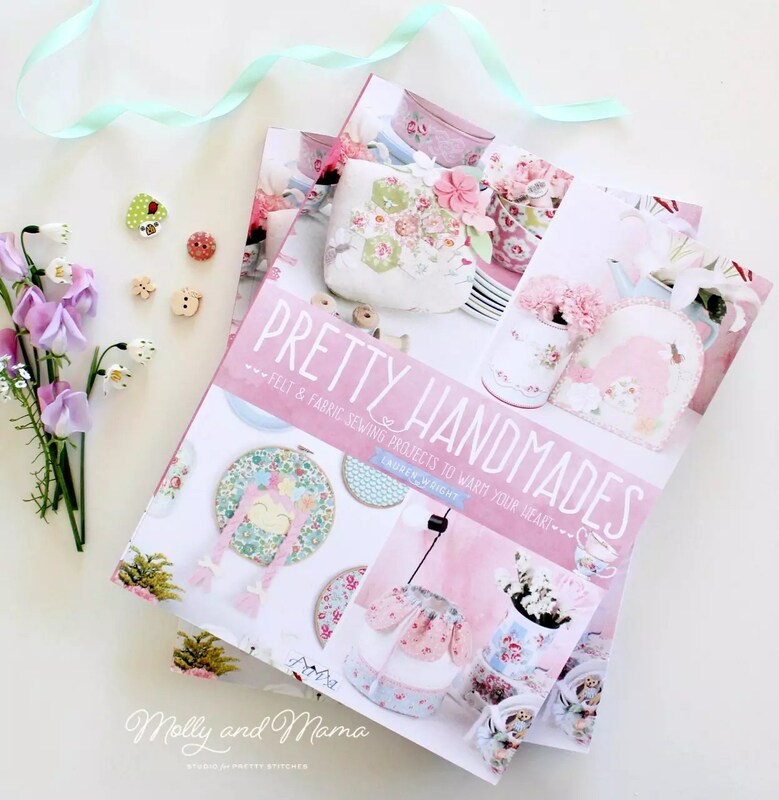 I’m Lauren and I have a love for sewing small, sweet things made with tiny florals and pretty pastels. 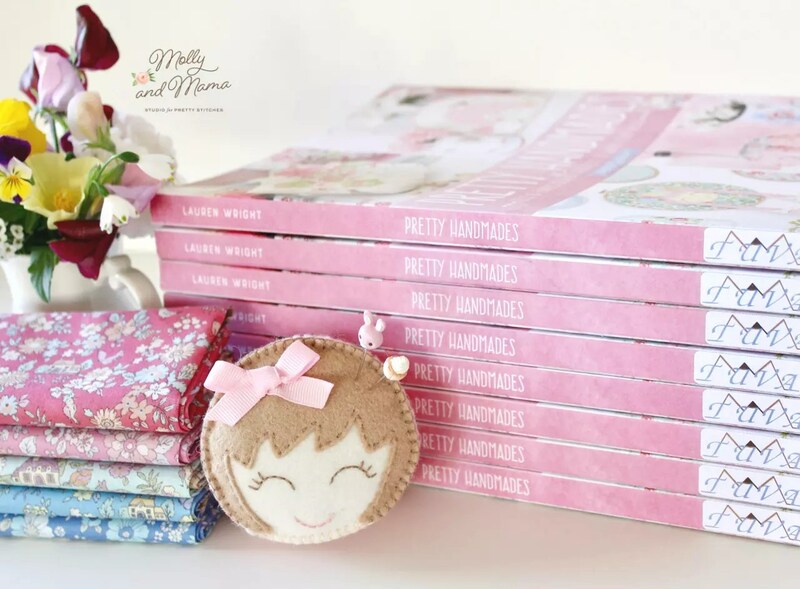 You can pretty much sum me up by the cover of my book, Pretty Handmades: Felt and Fabric Sewing Projects to Warm Your Heart *. But I’ll be sharing more on that tomorrow! So what am I all about? Well, I love designing all kinds of sewing projects. You can find free tutorials here on the blog. I also write sewing patterns which are available in my Etsy store. And I contribute patterns to other magazines, blogs and websites too. My latest pattern is in the current issue of One Thimble* digital sewing magazine. Jen the editor produces a brilliant e-zine that is jam packed with patterns, tutorials, articles, tips and more. For this ‘Under the Sea’ themed issue, I designed the Melody Mermaid Tail*. It’s perfect for snuggling and my daughter has taken to sleeping in hers! She loves the minky knit. I love the peachy tones and scallop pattern! Didn’t the photographer do a beautiful job too? It suits her model so well. I’ve also been busy updating all my sewing patterns and I’ll be adding some new PDF’s to the store really soon. You might have read about my Harvest Sewing Kit or the Hettie Hexie Mini Quilt patterns? I always come back to my Miss Molly Pin Cushion Pattern though. She was the first pattern I wrote and she is still my favourite. I think it’s something about her smile. I love this pattern because it gives a great introduction to working with wool felt. I am absolutely in love with this medium. It’s so versatile and easy to work with. If you need convincing, I have some great tips HERE. Rose Petal Collections has a wonderful range of wool felt colours, and Candice even sells glitter felt. I don’t buy felt anywhere else! If you’re looking for more felt projects, head to the Tutorials Tab. I have some quick and easy projects that are great way to ease yourself into working with felt. 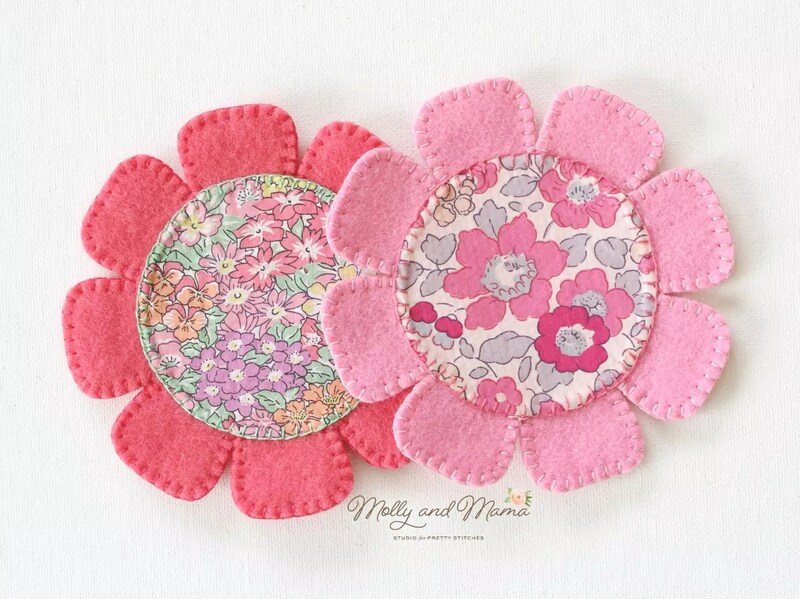 You might like to make the Felt Flower Coasters pictured here too. Felt seems to have made its way into almost every project in Pretty Handmades* . And if I haven’t used felt, then it’s Liberty tana lawn fabric. My mum and Aunty Judy have always loved Liberty and they passed that love on to me. So I have savoured their scraps and used those vintage pieces on special things. But there are such beautiful new prints and colour-ways in the Liberty range that I can’t resist buying more. Martina at Ava and Neve is very generous to me too! 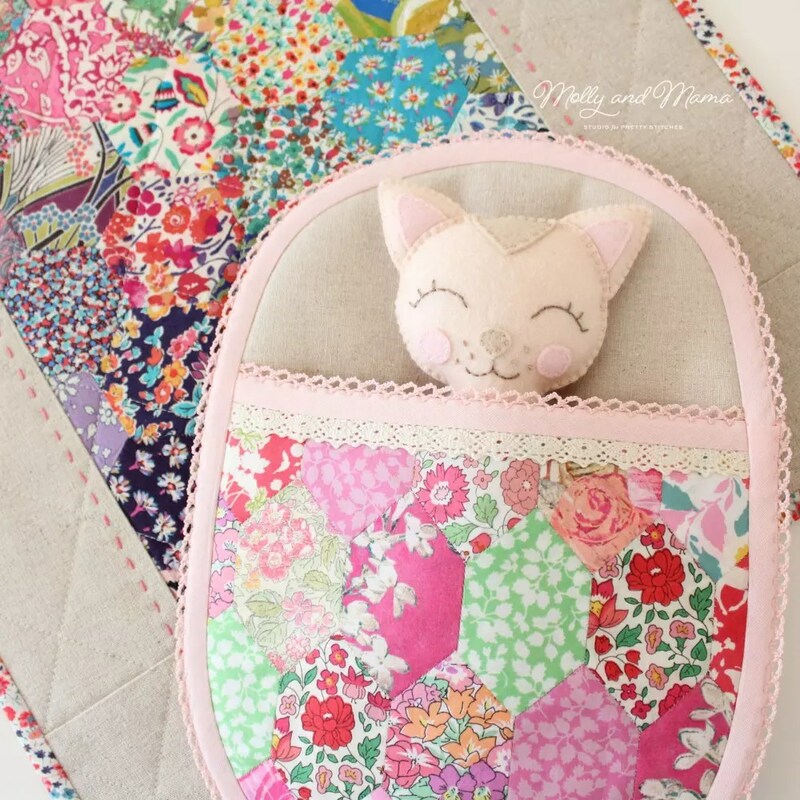 This is the Lullaby Kitty and Sweet Dreams Sleeping Bag projects from my book. Those tiny florals in Liberty just work with everything! When I am not sewing at home, I’m planning ways to reach out to other makers to share our love of sewing, crafting and creating. On the 9th and 10th of September you’ll find me at the Quilter’s Angel for their ‘Stitcher’s Dream Day Out’ event. As a Featured Designer, I’ve created two special projects for the weekend, and I’ll be teaching there too. I’d love to show you what I’ve made, but we’re keeping it as a surprise! I’m also running some workshops later in the year, so it would be great to meet you if you’re a local to South East Queensland, Australia! And in the mean time, I’d love for you to join the blog tour for my book. Stay tuned as we kick things off tomorrow!